Eggs, butter, pasta and a few herbs come together in a rich and silky sauce that is fast enough for a weeknight and elegant enough for company! Move over tomatoes…here comes the pasta with buttered egg sauce! These are a few of my favorite things: Soft scrambled eggs. Perfectly cooked hot pasta. Butter. Here are a few of my least favorite things: Bumper to bumper traffic that makes my commute twice as long. Power outages. Realizing that it is going to be JANUARY before the next season of Downton Abbey starts. Luckily, my favorite things make my least favorite things a distant memory…except for the power outage, and if you have a gas stove, you can totally make this comfort food in a power outage. Here’s how! If you break it down, this is basically a combination of buttered pasta mixed with very soft scrambled eggs and a little bit of herbs, but you need to put it together in a specific way to give it that perfect something something. 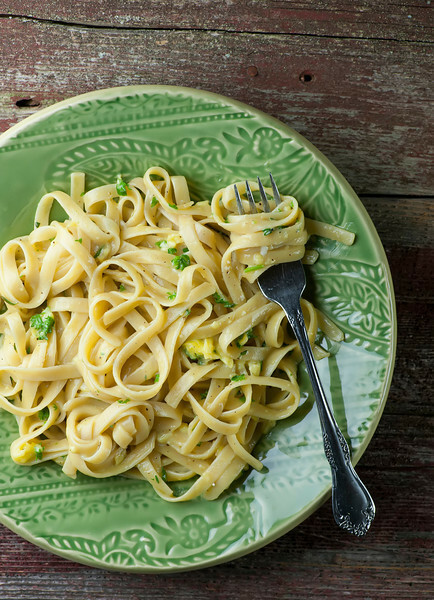 Start by cooking up your pasta – I like to use fettuccine for this one. Among other things, it’s good for twirling. I am a fan of twirling. Next, scramble your eggs very, very gently in generous amount of butter. You want them barely set, and as soon as they are, add the cooked pasta and a handful of herbs – I’ve made this with parsley, with thyme and with sage and they are all wonderful. Toss it gently with tongs until the eggs and the pasta are all mixed up. If the eggs get a little too solid, add a little bit of pasta water to loosen things up. You want it sauce-like. Add just a little bit of salt and pepper and transfer it to warmed plates. Scrambled eggs, pasta and butter. Works every time. Eggs, butter, pasta and a few herbs come together in a rich and silky sauce that is fast enough for a weeknight and elegant enough for company! Cook pasta in heavily salted water until done. Save 1/2 cup of pasta water and drain. Set aside. Melt butter in a large deep frying pan over medium heat. When it is melted, stir in eggs. Cook until just barely set, stirring once or twice to break them up. Add pasta and herbs and toss with tongs until the pasta and eggs are combined. Add a little pasta water as needed to give the eggs a sauce-like consistency. Add salt and pepper to taste, and serve right away on warm plates. Feel much better. Looks lovely. Do you have The Crimson Field over there? I have been watching that in the UK, it’s part of the start of World War I anniversary ‘celebrations’. I also recommend Call the Midwife. Have also been watching Fargo, so good, as well as Nashville, The Americans – brilliant – and second series of Boss. This sounds like such a comforting pasta dish! I’m glad we feel so similarly about pasta and eggs. And commuting. BLECH. Must try this on those days when nothing else but a bowl of carbs sounds good! This pasta was a huge hit.. I served it with roasted eggplant , tomato, red onion, red pepper, and tomato main dish. This is similar to an Italian comfort food which I grew up eating and still to this day will make. It uses any kind of pasta and eggs and carmelized onions. While you cook the pasta carmelize the onions. If you are using a full pound of pasta use 2 medium onions. Beat 4 or 5 eggs but don’t cook. When the pasta is done drain it saving about 1 cup of pasta water. Put the pasta back in the pot, throw the carmelized onions in, some butter or olive oil and the uncooked beaten eggs. Place this all back on the burner, turned to medium and toss constantly so the egg cooks onto the pasta, adding pasta water as needed to keep it moist. Mangia!!! simple yet it is my kids all time favourite! Save me alot! Thanks for the recipe. I think you might want to try a 18th century egg sauce recipe if you want a creamier texture. Just use finely chopped boiled eggs instead of mixed raw eggs! Thanks Selin! I’ve never heard of that method before, but I will give it a try! Kate, thanks! Very tasty sauce turned out. Very cool photos!